The pintxos bar culture in San Sebastián is based on the practice of standing, drinking and eating, the former of which most Americans are neither accustomed to nor keen on becoming well-versed in. Fellow Americans, this is a dish worth standing for: the setas y foie at Bar Ganbara. Bar Ganbara is a pintxo bar one must visit when in San Sebastian, if not the bar to visit. 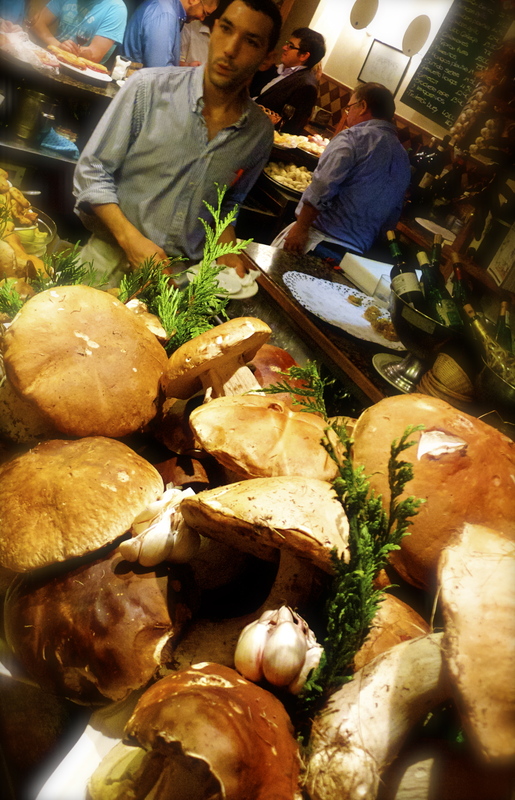 There’s no question one of their house specialties is mushrooms; just look at the size of these boletus! Obviously I planted myself at this end of the bar to take in their intoxicating bouquet of wood and pine. 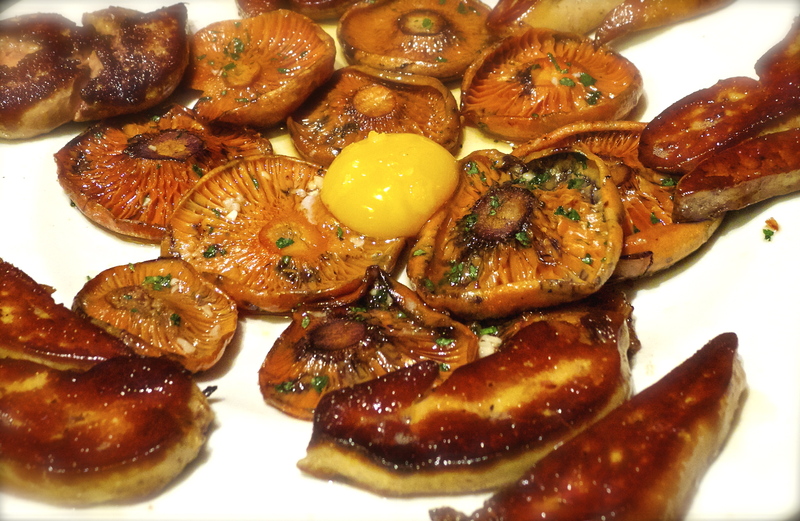 Complemented with perfectly seared foie gras and topped with a farm-fresh egg yolk and flaky salt—espectacular. Most pintxos bars will line their bars with ready-to-eat pintxos, whereas Ganbara dedicates a substantial portion of their bar to showcasing their pristine produce. Genial. While I’ve been here many times before, I must say revisiting Ganbara with fellow chef friends and San Sebastián culinary guru Gabriella Ranelli was the ultimate experience. One of my favorite pastimes in Spain and in any country is to enjoy the fresh, simple foods prepared by soulful moms and pops, and in this case, sons too. Cocina con alma. To relish it all in the company of fellow chefs and friends who share this same appreciation for and understanding of food culture, well that is truly good fortune. This entry was tagged Bar Ganbara, foie gras, mushrooms, Tenedor Tours. Bookmark the permalink. Why wasn’t I standing & eating with you! Been living in San Sebastian for the past month and I’ve passed by this place a gazillion times. Definitely need to check this place out now!